Fleurieu Harmony -What is Barbershop? Barbershop music, with its close, unaccompanied four-part harmonies and ringing chords, is a uniquely American folk art. It evolved in much the same way as other forms of vocal music. Although no one can say exactly when or where barbershop music began it is now generally accepted that barbershop singing originated in African American communities in the US around the turn of the century, where barbershops were, and remain today, social gathering places. The tight, four-part harmony of the form has its roots in the black church, where close harmony has a long tradition. In the early years of American barbershop music, singers improvised harmonies. When the printing press was adapted to produce musical notation, there was further advancement of the barbershop idiom. Many early pieces of sheet music were printed with standard vocal line and piano accompaniment, and with an additional quartet arrangement on the final page. The first uses of the term were associated with African Americans. The Mills Brothers learned to harmonize in their father's barber shop in Piqua, Ohio. Several other well-known African American gospel quartets were founded in neighbourhood barber shops, among them the New Orleans Humming Four, the Southern Stars and the Golden Gate Jubilee Quartette. 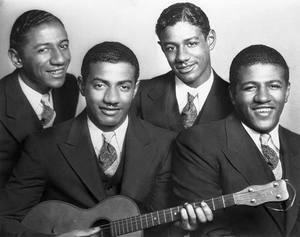 Although the Mills Brothers were primarily known as jazz and pop artists and usually performed with instrumental accompaniment, the affinity of their harmonic style with that of the barbershop quartet is clearly in evidence in their music and most notably, perhaps, in their best- known gospel recording, "Jesus Met the Woman at the Well", performed a cappella. Their father founded a barbershop quartet, the Four Kings of Harmony, and the Mills Brothers produced at least three records in which they sang a cappella and performed traditional barbershop material. At the turn of the century amateur singers, usually men, could often be heard singing improvised barbershop harmony at parties and picnics. Minstrel shows also featured barbershop quartets, who sang in front of the curtain as an "olio" act while performers and stage hands prepared for the next act. It was convenient to use a quartet for this purpose, since no props or instruments were required. Barbershop harmony's four voice parts are still called by their traditional names - tenor, lead, baritone and bass - whether referring to men's or women's vocal groups. One of the distinctive qualities of barbershop harmony is that the melody, sung by the lead voice, is below the tenor harmony. This follows the pattern of many early American hymns written for men and women, with the melody in the male tenor voice and the women singing harmony above. The barbershop harmony of today is a highly stylized art form requiring the same high degree of singing skill as other types of choral music. As the popularity of barbershop harmony has grown, so has the type of participation. Barbershop singing is no longer restricted to male quartets; there are also many women's and mixed quartets, and men's, women's and mixed choruses now enjoy this unique art form. Choruses ranging in size from 10 to 100+ members have found this singing style a challenging and exciting musical experience.